There are a lot of disgruntled gamers out there. For every video game series that has been abandoned or mistreated by its creators, there's a group of fans who want nothing more than to see their favorite titles restored to glory. Americans who love games like Mega Man Legends, Mother, and Valkyria Chronicles are angry. Dissatisfied. Upset at how they've been treated by the companies that claim to care about them. So let me tell you what's made people get so rabid over Suikoden. There's the story: every Suikoden game is stuffed to the brim with politicking, betrayal, and harrowing moments that subvert your expectations in some seriously surprising ways. There's the battling: in addition to main combat—a fast-paced take on standard turn-based systems—there are always multiple ways to participate in both one-on-one and large-scale warfare. And there's the recruitment: as sort of a side hobby in every Suikoden game, you can go around trying to convince people to join your army of heroes. It's these random side characters that make the series memorable; from warrior ducks to grizzly pirates to hermit wizards, almost every one of Suikoden's cast members is charming as hell. Screenshot from Suikoden Tierkreis, a game that many fans felt abandoned the spirit of Konami's classic series. Following the game's main five installments—and a few random spinoffs, including a Japan-only set of side stories called Suikogaiden that were basically visual novels—Konami released Suikoden Tierkreis, a spinoff for the DS. People didn't like Tierkreis. People really didn't like Tierkreis. For a number of reasons, but mostly because it ripped the series out of the rich world it had once inhabited. In previous games, you could recruit returning characters. You could read books about the world's extensive lore. You could piece together longstanding mysteries based on new information revealed in each new game. Each of the first five games could stand just fine on its own, but they worked even better as a whole. Tierkreis was totally different. It was the black sheep. 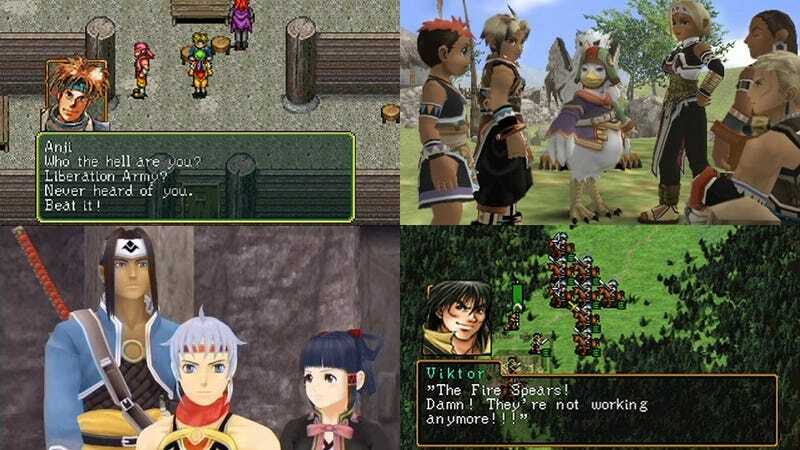 The last real Suikoden game was released in 2006. Fans have lost hope. So almost two years ago, when it looked like the series was all but dead (and rumors suggested that Konami had split up the Suikoden development team), Suikoden power-fan Chris Holmes started up a campaign on the forums of an old fan site called Suikosource. Their goal: to convince Konami not to give up on their favorite series. "The aim of the campaign is to revive the Suikoden series," he told me in an e-mail. "Originally, we were trying to make Konami see there is still a large enough fanbase for them not to give up on Suikoden. Essentially asking for Suikoden VI. Then we got the announcement of a new Suikoden. But it wasn't Suikoden VI. So, really, the campaign is still the same. We want a new Suikoden, but not a totaly unrelated spin off." The new Suikoden, released last December in Japan, still hasn't even been announced for U.S. release. Maybe it's because the PSP is on its last legs in America. Maybe it's because Konami thinks JRPGs should stay in Japan. I've asked Konami. They won't tell me. "Having Suikoden II on PSN is a must. It is a totally frustrating mystery to me why Konami has not done this already." Right now, if you want to play one of the older Suikoden games, your options are limited. The first was made available on PlayStation Network back in 2008, but the second, generally considered a masterpiece by everyone who's played it, has yet to show up. And people certainly still want it. As of right now, a new copy will run you $750 on eBay. Still, I don't think Holmes and his crew, which he says is about 200-strong, will give up hope any time soon. Like the ragtag group of heroes in a Suikoden game, they might be fighting against near-insurmountable odds. But they'll keep fighting. What else can they do?